Russian Liberal Democratic leader’s defamation suit against FT journalist dismissed | Russian Legal Information Agency (RAPSI). MOSCOW, April 15 (RAPSI, Nikita Shiryayev) - Moscow’s Ostankinsky District Court on Monday dismissed a 1-million-ruble ($16,000) defamation claim filed by the Russian Liberal Democratic Party (LDPR) leader Vladimir Zhirinovsky against ex-Moscow bureau chief for the Financial Times (FT) Charles Clover, RAPSI reports from the courtroom. Charles Clover, current correspondent of the Financial Times China and ex-Moscow FT bureau chief, has called Zhirinovsky an agent for the Committee for State Security (KGB) in his book “Black Wind, White Snow”. 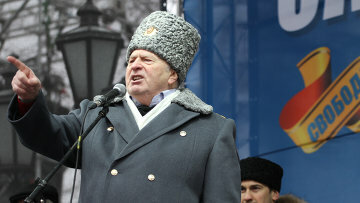 Zhirinovsky in his lawsuit asked the court to declare this information discrediting his honor, dignity and business reputation. The lawmaker also demanded 1 million rubles in compensation for moral harm from the defendant and refutation of the said information. The journalist insisted that he had confirmation of the plaintiff’s links to KGB citing the 1994 news conference of Kandemir, who told journalists that Zhirinovsky was arrested and deported from Turkey in 1969 for the communist propaganda and espionage. At that time, he also called the leader of LDPR a KGB agent. The book’s publisher, a third party in the case, and the defendant also stated the disputed statements had a suppositional nature and did not give negative color neither to the MP nor to the LDPR party.